No matter how picture-perfect and well-curated a mom’s Instagram or Facebook is, I guarantee that behind closed doors, they pull their hair out, too. And I’ll be the first to confess that while I of course share just the happy moments on my social media, there have been times when I flew out the door as soon as my husband arrived from work, because I simply couldn’t deal with parenting any more that day. And this has happened more than once. We tend to share our joyful moments on social media, which is great. But parenting is hard work, and most of the time, it’s not picture-perfect. Sometimes, we all have our moments, and it’s perfectly OK to have them. Despite of our denial of the large spectrum of human emotion, it’s OK to feel all of them. 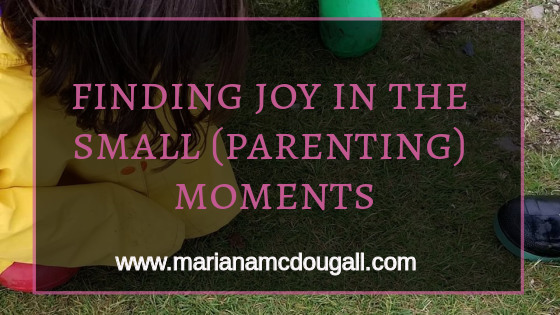 But once you’ve spent some time with your punching bag, or done your yoga, or taken your walk, or said your prayer (whatever it takes to calm those parenting nerves down), take some time to feel the joy of the small moments. Even in those times when our kids are at their apparent worse, they still bring so much joy into our lives. Whereas it’s with a cute smile or laugh, or with the funny things they say, joy is in every one of those moments. It’s important, when we’re feeling like we’re totally done with parenting, to remember that our kids bring us more joy than they do hardships. The hard moments are there, of course. They always are. But finding joy in the small things can help us get through those difficult times. When things are getting out of hand, deep breathing truly helps. Taking a few deep breaths actually helps us calm down. Sometimes I even sing Daniel Tiger’s song out loud. I think this is actually helpful for the kids: they see me dealing with my anger in an appropriate way, and it gives them a good example of how to deal with their own strong emotions. And no, I’m not perfect—far from it. I still yell far more often than I’d like. But I try to remember to calm down, and I’m getting better every day. Sometimes we’re so busy “doing” that we forget just “being.” Sure, it’s nice to have a clean house. But I’d rather spend the time looking for those small joyful moments with my kids. And if the clean house is ultra important, you can always create games that the kids will enjoy and will get the house clean at the same time. I’ll be honest, I find very little joy in playing with toys with my kids. And their favourite activity, Lego, makes me anxious. I’ve always had a hard time with puzzles, and Lego is difficult for me. But I LOVE board games, and to my delight, all of my kids love them, too. So we make a point of playing board games regularly, and I try to really enjoy these times. I try to take it all in and really remember these moments. When your kids are grown and have their own families, they’ll create their own traditions. So create yours now. For us, that’s “compliments time” at the dinner table. Our family strongly believes in treating others the way you’d like to be treated, and everyone likes to be recognized for their efforts. So we make a point of recognizing each person every day at the dinner table. We go around the table, giving each person a compliment about something we’ve noticed them do that day. This has created joyful moments for us, when we see that our kids really are watching, and that even on the hard days, they still appreciate us, and vice versa. To find the joy in the small moments, remember to take some time for yourself, create memories that matter, and calm yourself down before responding to your kids when tempers start to rise. How do you create joyful moments?